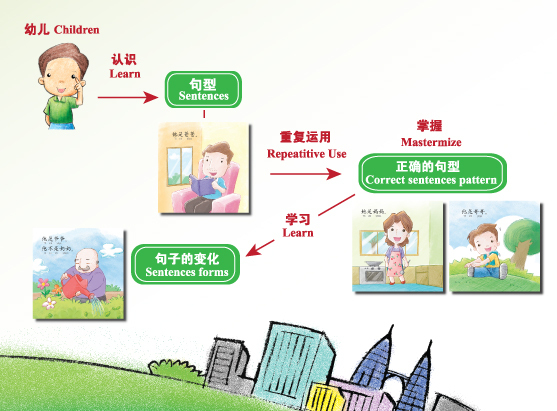 This series of ‘Learn Sentences’ is specially prepared for 2 to 6 year-old children. It enables these young children to recognise sentence structure. Through repetitive usage, it allows them to grasp sentence structure correctly. After that, they will learn to mix-and-match sentences. This will enhance effective learning, whereby different sentence structure and construct would be recognised. Hence, further strengthening their language expression. The contents of this series encompass selected themes, which made understanding easier. Lively pictures and simple sentences help children to understand easily. Colourful pictures of different styles further enrich the lovely experience.This series is made up of 3 sets. Each set contains 10 books. Every set comes with a revision book which is filled with stories, to strengthen what the children had learnt. Teachers may carry out interesting activities guided by the revision book, for example, reading aloud, story-telling etc. This series also comes with a Han Yu Pin Yin guide for teachers’ reference.